For all of you who aren't wimps, this won't be a big deal. But for me, it's HUGE! I am totally afraid of heights so I was less than thrilled to find out I was going to a "team building" day with my boss and new team a couple of weeks ago. This is a climbing gym in Little Rock. 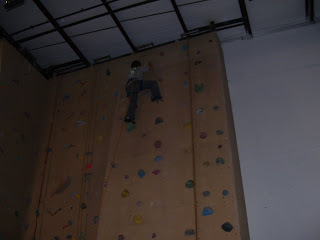 I'm a tad embarrassed to say it took me three tries to get to the top, but I did. And, of course, I made them take a picture so I could prove it to Lee. Way to go, Rhonda! I am so proud of you. I also hate heights and I'm not sure I could have done that. (For one thing, I'm not as strong as I was at your age.) I'm glad you have the proof for all to see. Wow! Glad I'm not part of the HI team today! Go Rhonda! Woot Woot!